Lindsey Graham budgeted more in military aid for 2017 than administration is willing to give, and the White House refuses to sign agreement. 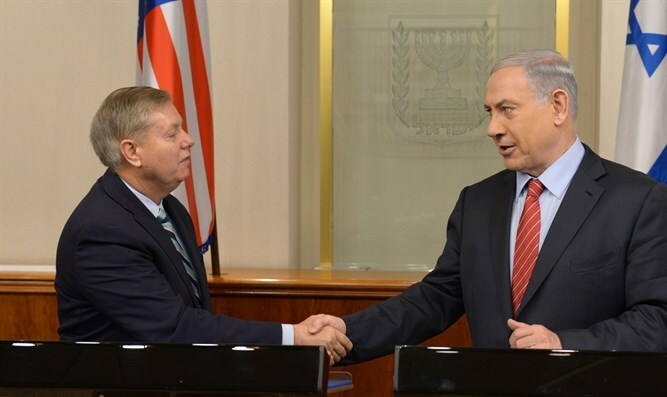 Republican Senator Lindsey Graham is the person responsible for the memorandum of understanding (MOU) concerning security aid to Israel for the next ten years, which has yet to be ratified by the Obama administration. Negotiations have ended already according to senior representatives on both sides but the agreement has not been ratified yet because Graham refuses to back down from the additional aid agreed between the sides for 2017 - even though the agreement has yet to be in force by then. The original aid which the administration intended to give Israel in 2017 stood at 3.1 billion dollars but Graham managed a few months ago to approve an additional 300 million dollars in the subcommittee for foreign aid which he heads. The addition was also anchored in law. The Washington Post reports that the administration did not complain to Graham, but Prime Minister Netanyahu stressed to him that the matter causes problems for him. Graham himself reportedly said that "The Israeli prime minister told me the administration is refusing to sign the MOU until I agree to change my appropriation markup back to $3.1 billion", to which he responded with a thick curse. He claimed that the aid to Israel should be a base and not a ceiling for the amount of aid available to Israel and if necessary it should be enlarged. It should be noted that the Americans view the sum agreed upon for the next 10 years of assistance which is estimated at 3.8 billion dollars as a very heavy sum. A source in the administration described it as "the highest amount of military aid given to a country in American history." The source added that this was the "last chance for Obama to leave his mark as the one who anchored the strong support of America for Israel's security." In the meantime, Obama is in no hurry to meet Netanyahu next week in New York or Washington, despite efforts from the Prime Minister's office to organize such a meeting.